What are the best Halloween costumes for girls in 2017? 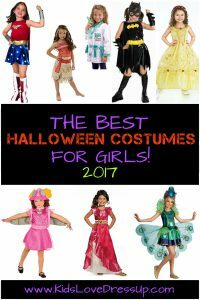 We’ve done some digging and have come up with a list of 10 of the most popular, highest rated, and generally most awesome costumes for girls to share with you today! It’s so much fun to find “just the right costume” for Halloween. Whether your girl is into princesses or superheroines, career dress up or animal costumes, whether she is obsessed by the “name brand characters” or doesn’t even know them yet (or care), there’s something here for everyone! It’s my hope that this list will be helpful for you Moms to get you started (and maybe finished with) The Big Choice. Have fun browsing! 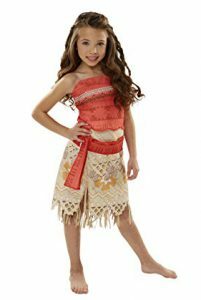 Depending on where you’re located, this costume might be a bit too cool for Trick or Treating this year, but you can’t NOT have this awesome Moana costume on a list of the best Halloween costumes for girls in 2017! Moana, the daring, adventurous, and compassionate girl who saves her island from the mysterious darkness… no doubt the girl you’re shopping for would love a wild adventure too! In this costume, she can feel like she’s right there! Wonder Woman is big this year for girls, as far as Halloween costumes and girls dress up clothes go! Why leave all the saving-the-world fun to the boys? She can dress up in style in this awesome, patriotic costume! Check out this and a slew of other awesome costumes on our Superhero Costumes For Girls page! Rate 4.1 / 5 stars by over 865 reviewers! 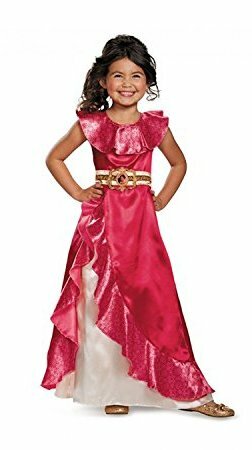 Princess Elena of Avalor, the feisty, strong-willed, creative girl who saves her kingdom in the Disney show “Elena of Avalor”… she’s one popular princess in the Dress Up / Costumes world! No wonder – her gowns are stunning! The bright red and gold, the Spanish flair – this is a seriously pretty costume gown for any girl! Rate 4 / 5 stars by over 135 reviewers! Beauty and the Beast is a classic that little girls everywhere have fallen in love with – from the 1991 animated Disney film to the new live action release just this past year. The songs, the story, the DRESS!!! 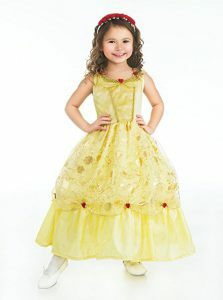 This yellow princess gown will have your own little Belle feeling like a true beauty. Little Adventures gowns are great quality, easy for kids to take off and on, and believe it or not, comfy! Worth a look for sure. Playing doctor is a staple childhood game, and this costume role play set is a fantastic prop for it! 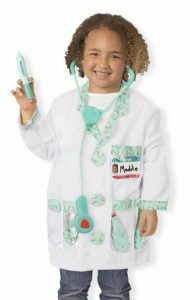 With all of the important accessories and the iconic white lab coat, your little girl will be ready for her next patient… AND trick or treating! We own this exact set… it’s amazing. See our review here. Rated 4.7 / 5 stars by over 645 reviewers. 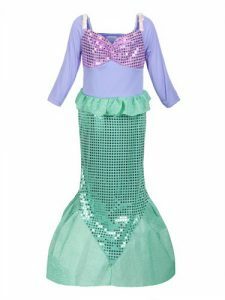 Mermaids are always popular with girls… and THIS costume is the highest rated and most popular one on Amazon these days. (Check out the customer pics in the review section by clicking on the image to the left – it’s adorable!) Whether your girl wants to be Princess Ariel from The Little Mermaid or another one, this costume will do the trick nicely. Love the mermaid idea? See also “7 Gorgeous Mermaid Costumes For Girls That You Don’t Want To Miss” for more options. Have a Batman fan in your house? One of the best Halloween costumes for girls is one that she feels confident in, looks great in, and has fun in – and this Batgirl costume is exactly that! It’s just what she needs to Trick or Treat in style… and stay ready to beat the “bad guys” and “save the world”! This is a stunning costume! If your girl wants a statement costume, one that gets her a lot of oohs and ahhs, you HAVE to check out this one! The headpiece, dress, and tail-feathers (attached by the wrist) area all included (not the shoes, unfortunately) – and it’s available in Small, Medium, and Large. And there we have it! 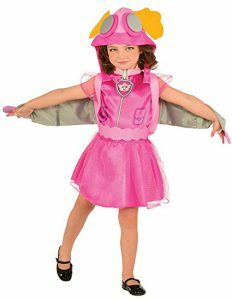 10 fantastic costumes for girls – each will be an awesome choice, each comes at a surprisingly good price! Thanks for taking a look… I love having people drop by my website (it’s so fun to work on it) – drop me a line to say hi, and tell me what YOUR favorite Halloween costumes for girls are this year! Did I nail these choices? Or am I missing something important? Thanks so much for organizing this list…makes my life so much easier, especially since I don’t know much about the girl side of things. I have 3 boys, but I know my wife is wanting to get a costume for our niece, so that she can match the superhero theme that our boys are going to be wearing. Batgirl beats out Wonder Woman in our situation. Thanks for the timeliness on this list! A superhero theme will be so much fun! Is your niece going Trick or Treating with your boys? She’ll fit right in as “Batgirl”! I have a post dedicated to Superhero Costumes For Girls – check it out if you’re still thinking it over – there are many fantastic costumes! Thank you for this awesome list of Halloween costumes. I have friends and relatives that have girls that would be interested in knowing this list, I will let them know. These costumes are so cute. I will definitely get one if I have a girl. Thank you for your hard work putting together this list. Thank you for sharing this information, keep up the good work! Glad to help, Jamie! No doubt your little girl is looking forward to Halloween, not just for the candy, but for the opportunity to add another costume to her dress up clothes collection! My kids LOVE playing dress up year round too! Great article!! I love Halloween and dressing up the kiddos is my favorite. I really like the variety of themes you have listed, it definitely gives me some creative ideas for my little one. 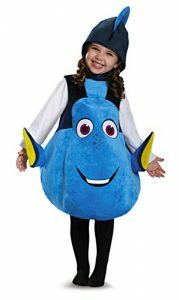 The costumes you have choose are very age appropriate, which no adays is hard to find. I will definitely be sending this page to a few friends!! Thanks for your encouraging comment, Danielle! Dressing up for kids is SO much fun! I do try my best to keep the costumes I feature here truly for KIDS. It really bothers me seeing something that’s so fun turn into something completely NOT age appropriate (or even appropriate for adults sometimes, for that matter… what IS WITH the whole death culture stuff?? YUCK! I can’t even take my toddlers into a drugstore without them getting scared of gruesome costumes displayed everywhere). Have a fun time picking out something for your little girl!